It's taken me a while to work out how I can get this photo onto here - apart from other interruptions. Daphne sent it as a word document, rather than a jpg, and initially I couldn't work out how to get it into a photo format. However I had to do the same thing at work a couple of times recently and that's helped. This is a gathering of (Jack and Daphne) Hannagans. Daphne wrote at the time: A Daphne Hannagan family photo, the only ones missing being the Millers. There's actually an addition of 2 mother-in-laws - Bob's mum and Ross' mum. T'was taken on Mothers' Day. I haven't yet seen any of the photos from the combined birthday party. 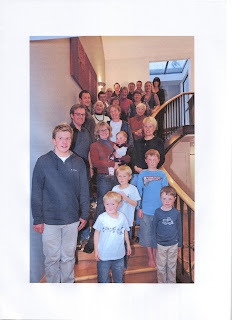 [The combined birthday party was Denise's 50th and Peter's 40th]. Probably best to click on this to view it clearly.